pH is the measure of the acidity or alkalinity of a substance. 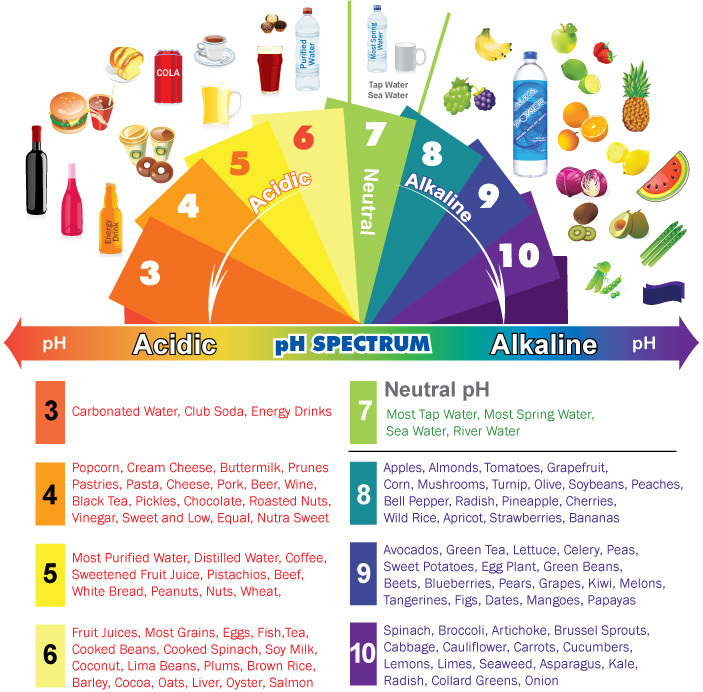 The pH scale runs from 0 to 14 — a lower number means a higher level of acidity (and generally less oxygen) is present, and higher number indicates a higher level of alkalinity. A solution is considered neutral, neither acid nor alkaline, when it has a pH of 7. The stomach should contain plenty of acid in order to do its job effectively, but otherwise a slightly alkaline environment allows the body’s metabolic, enzymatic, immunologic and repair mechanisms to function at their best. Our bodies continually strive to maintain a normal pH balance of about 7 to 7.4. When the pH of our bodily fluids, digestive system and tissues is pushed out of that comfortable neutral zone, health problems can be the result. The most common form of pH imbalance is excess acidity, which not only impacts your overall health, but also greatly impedes your weight loss efforts. This is because, outside of the stomach, acidity is a major cause of hormonal imbalance which by doing this has the potential to cause weight gain. Excess body acidity is prevalent today because poor diet, insufficient exercise, over-exercising (especially too much cardio, which contributes to stress) and chronic stress can lead to excess acid in our internal environment. When our body becomes acidic, minerals such as potassium, sodium, magnesium and calcium may be stolen from our vital organs and bones to combat or buffer the acid. • Osteoporosis, weak or brittle bones, fractures and bone spurs. These problems are not surprising, since excess acid can also interfere with our hormones. For example, in an acidic environment, as much as twice the amount of estrogen may be needed to exert its effects in the body. So, if you have a health problem, you are likely a walking acid trip. No matter what type of therapy you choose to treat your condition, resolution will not come until your pH balance is restored. You will also enjoy the most dramatic results from your healthy lifestyle habits when your body is slightly alkaline. Acidity decreases your body’s ability to absorb the vitamins and minerals from your foods and supplements. It interferes with your ability to detoxify. It disrupts your metabolism and it makes you more prone to fatigue and mood changes. You can test your body fluids (saliva or urine) using litmus paper strips purchased from your local health food store. Test your pH with your saliva or urine first thing in the morning, one hour before a meal or two hours after eating. Saliva: Before brushing your teeth, fill your mouth with saliva and swallow; repeat, then spit directly on the pH test strip. This three-step process will ensure a clean saliva sample. Measure your saliva pH in the same manner again later in the day, at least two hours after eating. Urine: Collect a small sample of your first morning urine in a clean glass container; dip the pH strip in the container. Match your strip to the associated color on the package of pH papers to determine your body pH. Ideally your pH strip should turn the same color matched with 7.2 to 7.4 on the package (usually dark green or bluish depending on the brand of pH papers you purchase). If the pH of your saliva stays between 7 and 7.4 all day, your body is functioning within a healthy range. If your urinary pH fluctuates between 6 to 6.5 in the morning and 6.5 and 7 in the evening, your body is within a healthy pH range. First morning urine should be slightly more acidic as you eliminate waste accumulated throughout the night. Continue to measure your pH daily if your values are abnormal, otherwise testing once a week will suffice. What can you do if you are acidic? 1. Increase your intake of dark coloured fruits and greens Most are alkalinizing. 2. Reduce high-protein foods, processed cereals and flours, sugar, coffee, tea and alcohol, which are acidifying, while increasing vegetables, millet, quinoa, soy, almonds and wild rice, which are alkalinizing. 3. Upon rising and prior to meals, drink the juice of half of a lemon in water. Lemon is naturally alkalinizing. 4. Eat one cup of alkalinizing greens daily (such as spinach, kale, collards, mustard greens, rapini, water cress, bok choy). 5. Choose fish over beef and chicken for less acid-forming animal protein. 7. Use olive oil as it is less acid-forming than other vegetable oils. original source material – article on chatelaine with Natasha Turner.